Both male and female gila woodpeckers have a brown face, black and white zebra striped back, and white wing patches that are visible during flight. Adult males have a red cap of feathers on the top of their head. Woodpeckers have very strong head and neck muscles so they are able to withstand the shock of pecking into trees and other materials. They have a long pointed beak as well as a long sticky tongue with a bristle-like tip. 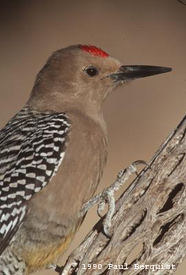 Gila Woodpeckers are permanent Sonoran Desert dwellers and are found in all of its habitats. This woodpecker can be found in southeast California, southwest Nevada, southern Arizona, southwest New Mexico and south into central Mexico. Currently they are not threatened in the wild. Gila Woodpeckers eat mainly insects, but they will also eat cactus fruits, mistletoe berries and other seasonal fruits. They have adapted to human populations by learning to hang onto backyard hummingbird feeders and lick up the sugary water. They also have been known to steal dog food from backyard porches. Predators of the gila woodpecker can include bobcats, coyotes, hawks, housecats, snakes and fox. Woodpeckers nest in cavities that they excavate with their long beak. In the Sonoran Desert they often make these cavities in saguaro cactus. The inside of a cactus provides a safe, cool place for the woodpeckers to raise their young. The excavated cavity is called a "boot". In captivity gila woodpeckers can live as long as 10 years, much less in the wild. The adult woodpecker weighs about 3.5 oz (68 gm) and is 8-10 inches long (20-25 cm). Woodpeckers will loudly bang on metal chimneys and pipes to declare their territories and to attract mates. Owls, kestrels and other birds will use a vacated woodpecker hole for their own nest. Compare with the White-browed Treecreeper of the Australian Desert.